January | 2011 | Quilting my way through life! Ours was working just fine, then one day the week after Christmas, the kitchen receptacle breaker started blowing. It did this perhaps 3-4 times since that time. So, last week with out of town company visiting, we went to the hardware store to pick up a new breaker. Sure I chose the $5.00 fix, who wants to think otherwise? Well, yesterday morning the breaker blew several times while my DH was home. The second time it went off, he installed the new breaker. Then this morning our youngest daughter warmed her coffee cake and the microwave went off. Unfortunately the breaker hadn’t blown. Ugh, it’s not the $5.00 fix after all. It’s the microwave! Have any of you heard about the winter weather we’re having her in the midwest? Well, I can do without milk and I can do without bread, (we won’t) but I cannot do without my microwave! So lickity split, out the door I went this morning to our local mom & pop appliance store to fetch a new one. Here it sits in all its glory, awaiting Mr. Tinker to slide it into its new home. Want to know the best part, aside from the fact that my husband is handy enough to put it into our kitchen tonight? 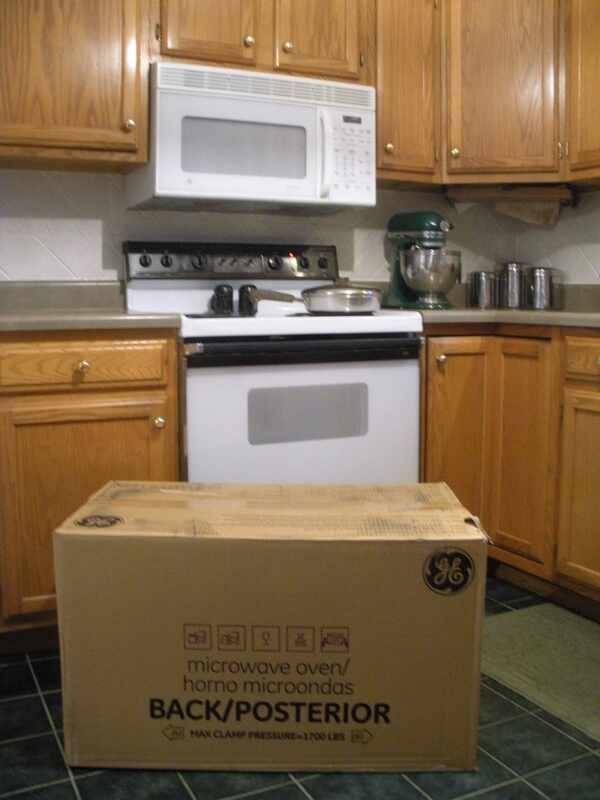 The existing microwave was bought in 1996 for $388.00, and today’s model to replace it was just $200.00! I’ll be pleased if it lasts just half as long as the original. So this is why I started thawing hamburger on the stove at 2 p.m. today. It’s a very slow process without a microwave. Thank you Mr. Spencer, I’ll never take my microwave for granted again! Have you ever done hand embroidery work and been disappointed that the tails of your threads show through the fabric? There’s an easy fix to this, and I’ve been using it on all of my “In Season” patterns. Check them all out on my website. They each have a bit of hand embroidery on them, and I have a tendency to stitch in black. This really plays havoc with a light background fabric, and obviously every color is lighter than black! As described in each pattern, to alleviate this problem, just cut a piece of batting a bit larger than your background fabric. Baste this batting to the fabric. I use straight pins. 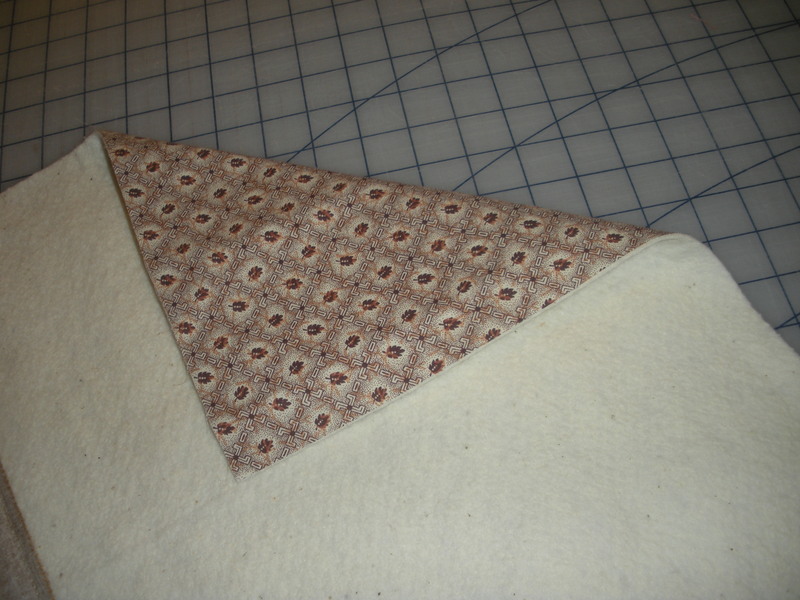 It takes very little time to do this stitching, so I don’t want to take more time than necessary to baste. For bigger projects I would use safety pins. Stitch as usual, securing your thread behind the batting. This is a peek at my latest creation, “In Season for patriotism”. Coming soon to a quilt shop near you! Even trailing letter to letter doesn’t show, and I’m using #8 (thick) perle cotton black thread!!! 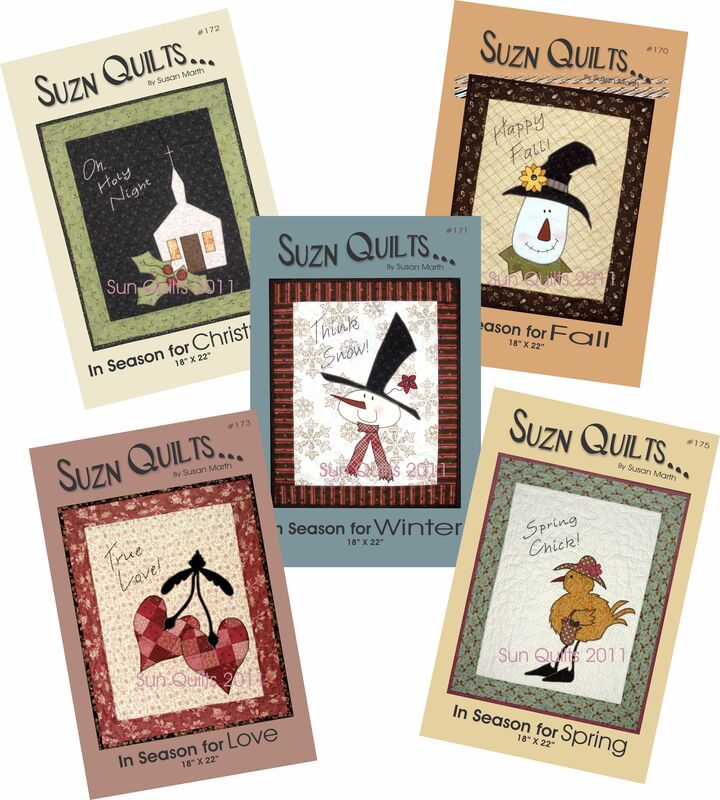 I hope you’re getting lots of quilting done during this cold, snowy winter! As promised, I have another new pattern to show you today! It’s fun to make these small projects. 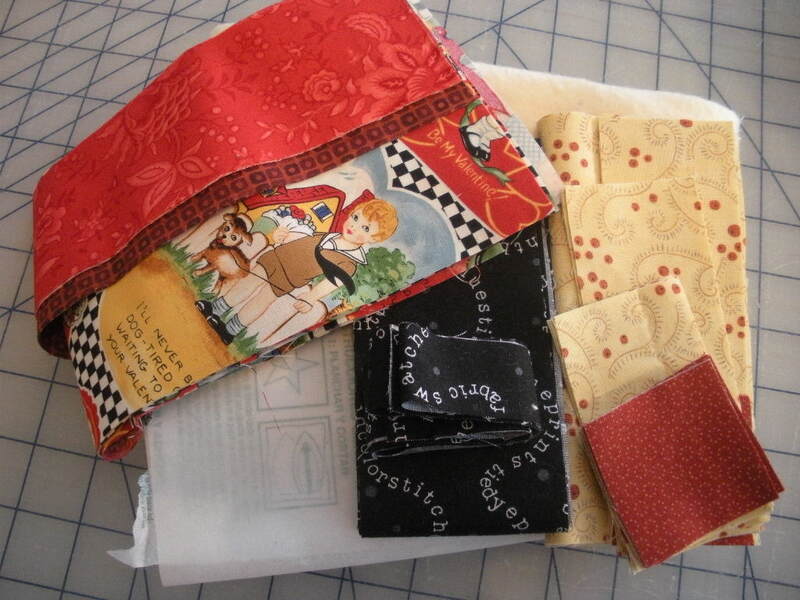 I’m even making two sets, so I’ll have a spare set for trunk shows to go out to quilt shops. That goes to show you just how fast these little projects are to make. Translated, you can buy the pattern this year and hang it or give as a gift this year too! This is the 5th pattern of my “In Season” series. You can see all 5 of them on my website. Tomorrow you’ll see a sneak peek at my next “In Season” quilt that’s now on my drawing board. I’m telling you, they’re fast & fun to make! I’ve got a new pattern, actually two, but I’ll share one today and one tomorrow, how’s that? Between Christmas breaks, snow breaks, anniversary, birthdays, I’ve been quite distracted… you can’t keep me from my fabrics! I love this vintage valentine print, how about you? I liked it so much and I had enough fabric, that I made kits. 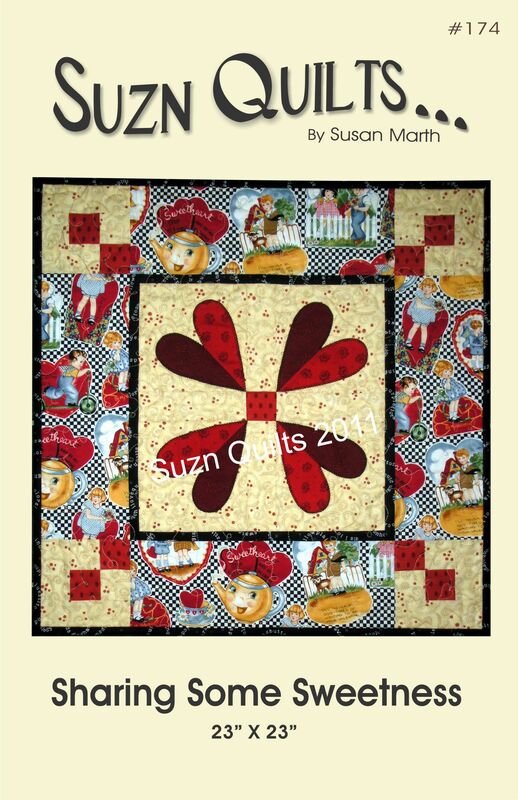 The kit includes all you need to make the quilt; pattern, fabrics, fusible web, batting and backing fabric too! You’ll see a lot of the cutting is done for you. The only thing you’ll need is thread and you! I only have 4 kits, so if you’d like one you better hurry! The cost is $40+ $4.95 shipping. 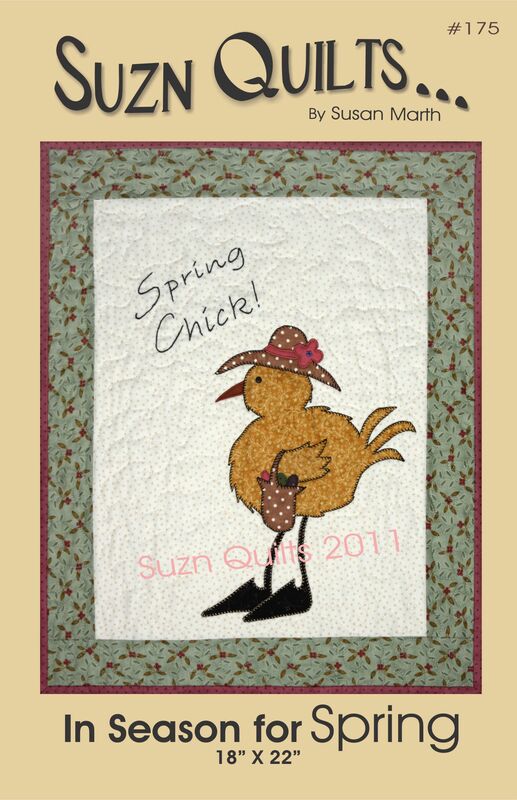 Email me suznquilts@aol.com to order one. What a fun gift for you or a friend. Of course the patterns are also for sale on my website for $9.00 + shipping. Call me lazy. Call me gotta do it fast. Call me whatever you want, but if I can do something quick, I can get more done. That’s exactly why I like the Chako Liners. Do you know about them? There are several styles, but this is the one I use. 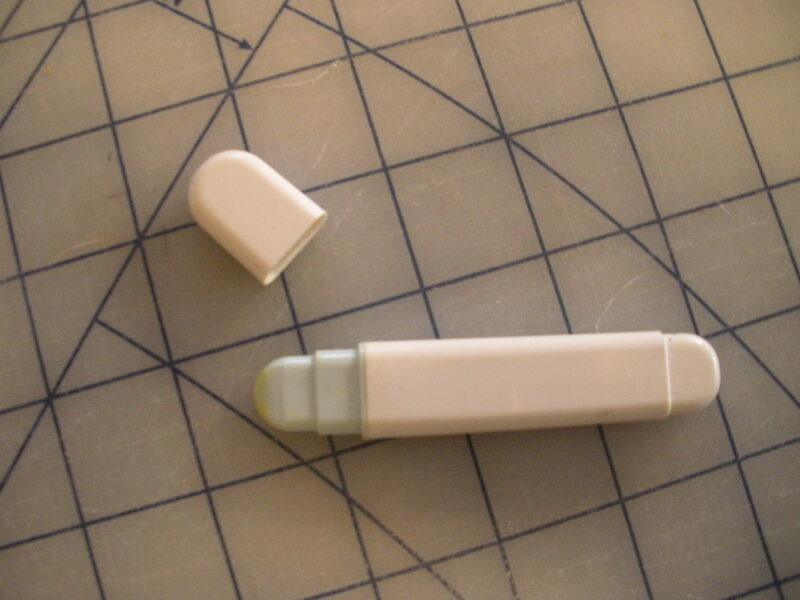 It has a VERY tiny wheel at the top that allows a powdered chalk to flow out in a very fine line for marking. Did your mom ever use a tracing wheel? Mine did and this is what my Chako Liner reminds me of except instead of using a piece of colored paper to make the mark with, it drops fine chalk dust! Although I would probably not mark a whole quilt with this, it’s great for small projects. You can mark straight lines quickly using a ruler. It’s great for cross hatching. I used this on my “Best Friends” samples. 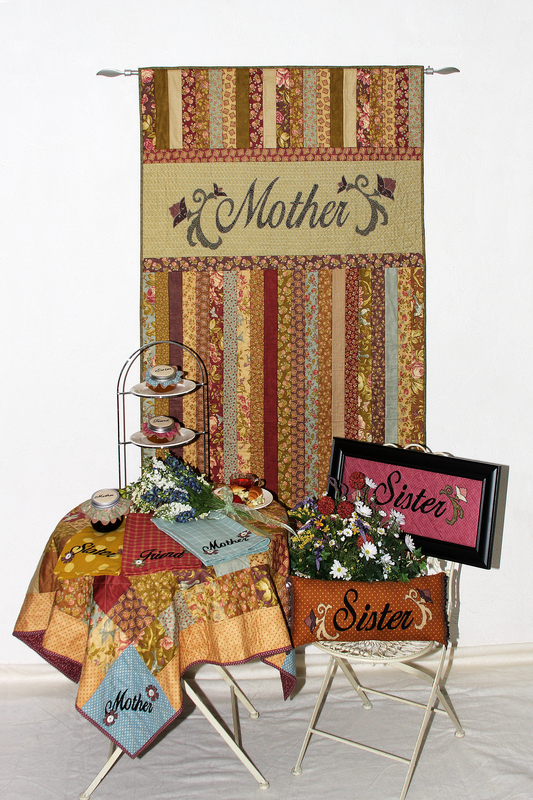 If you look closely at “Mother” on the hanging quilt you’ll see cross hatch quilting. I marked that with the Chako Liner. Also “Sister” on the framed piece has cross hatching. That too was marked this way. They are both small areas, so it’s a quick way to mark, plus the lines literally brush away when you’re finished with them. They’re made by Clover, they come in several colors and you can buy refills. Next time you have a small area that needs some straight line quilting, think of the Chako Liner and how much time you’ll save. How many of you maintain your machine regularly? How many of you even know you’re supposed to? When my mom bought her Singer in the early 60’s, the man who sold it to her knew his stuff. He taught her to maintain her machine and surprisingly enough even taught her basic repair. Who does that today? Most machines are so complicated, most of them computerized, that you dare not mess with them unless you have a license! Well, my mom taught me some of those basics, but if I have any real trouble I call her down. Fortunately for me she lives just down the way and is happy to help me out! I got my love of Berninas from her. Actually the 930 that I sew on and have been using for over 20 years was hers originally. My mom sewed my wedding gown on it, that was a huge undertaking. Of course being of the design mind that I am, I had all kinds of neat ideas, but no pattern was on the shelf, so… I had bridal magazines with pictures of this sleeve, this bodice, this bottom, and a button-off train (that one was in my head! Could I be any bigger of a pain?). Like I said, no pattern would accommodate this dress, so we went pattern shopping and bought several patterns with basic shapes of some of my big ideas, then my mom’s creative brain set to work. Any idea where my brain came from??? Anyway, I’d come home from work, and she’d created a new sleeve prototype, ruffled bottom prototype, you remember the “mermaid” style dresses of the late 80’s? Well, some days they’d be just right and some days it was back to the drawing board, but she took it as a creative challenge. What a mom I have! Did I mention she also sewed the whole wedding party’s dresses? Uh ya, three bride’s maids dresses, plus my two SIL dresses who were cake cutters, and last but not least my only niece was two and so adorable that she got a green dress too! 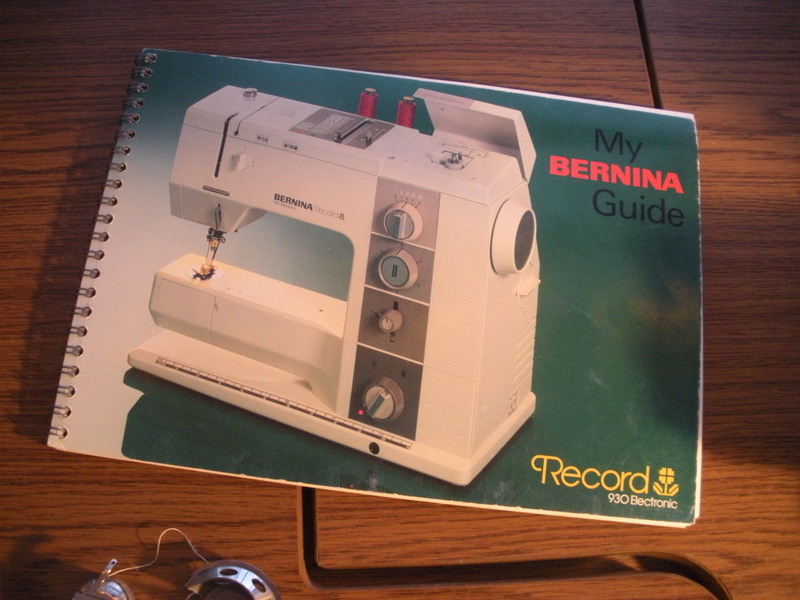 Oh but I digress… Well, when my mom wanted to upgrade to Bernina’s computerized machine, I bought her 930 and have loved it ever since. The first thing my mom showed me was this. There’s a section on cleaning. 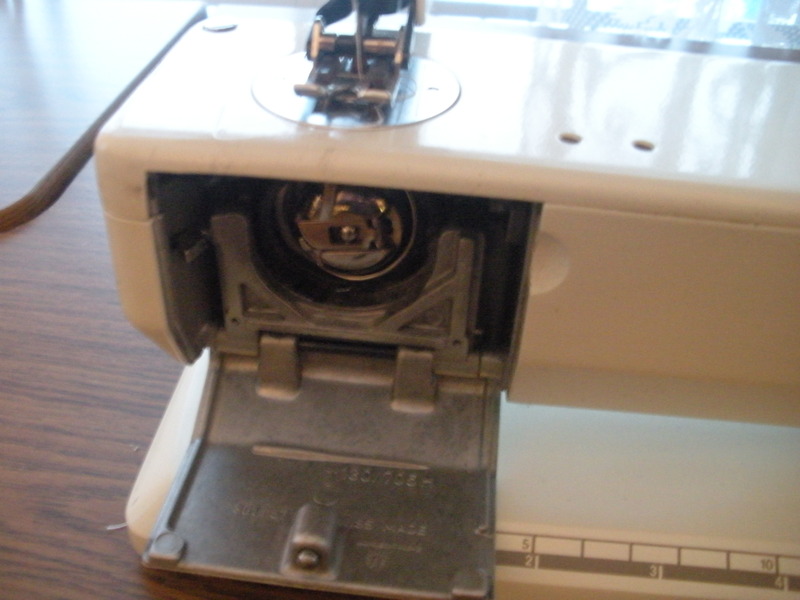 I was amazed at one of my classes several years ago when a quilter’s machine was not sewing well. 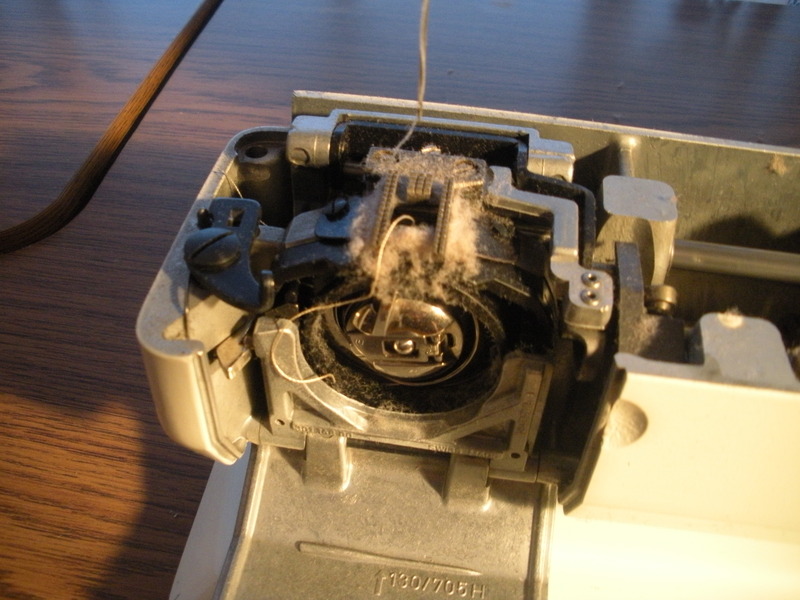 Obviously the needle was not making connection with the bobbin thread for some reason, so I opened her bobbin case and was amazed at all the lint under her stitch plate. She had no idea she was supposed to clean the lint from the area and her machine was several years old!!! Since that class ten years ago, I’ve encountered more quilters with the same amazement about their machine. Some had bought their machines at big box stores, but some had bought their machine from a dealer. So, today I’m urging you if you don’t know how or you can’t remember the last time you cleaned out your stitch plate area do it now! Some machines open even more. This makes cleaning all the easier. Look at all that lint! I just finished quilting a little quilt last night, so I knew it needed cleaning. AND, I just cleaned this all out two days ago!!! My owner’s manual states that I need to do this cleaning after every 3-4 hours of sewing. It also tells me where to put a couple drops of special oil at the same time. My machine is basically all metal, so it needs oil to run smoothly. Some machines do not need oil, that’s why it’s important to get out your manual. 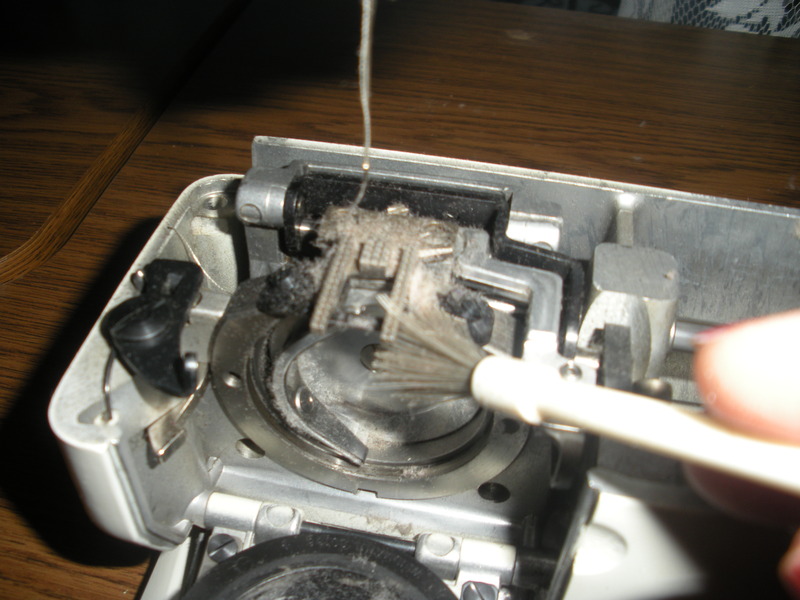 In addition to this cleaning, do you realize you should have your machine professionally cleaned by a reputable professional once a year? The pros can get into your machine and deep clean it. If you do this your machine should run for a very long time. Being a quilt pattern designer and going to International Quilt Market at least once a year for the last six years, I’ve met a LOT of quilters; quilt shop owners and their employees, other quilt designers, fabric reps, distributor reps, notions reps, batting reps, thread company reps, and the list goes on and on. 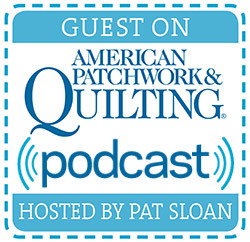 I’ve learned so much from these quilters’ experiences, plus I’ve experimented a lot myself. This morning while mindlessly ironing my DH’s dress shirts I got an idea, (I get some of my best thinking done while doing these types of monotonous tasks, and don’t you dare tell him or he might get some of his own great ideas such as thinking that I enjoy said tasks) anyway… I thought I would list some of my favorite things and perhaps they might become some of your favorites too. The “foundation” is actually the batting and backing fabric cut to the size of the finished quilt, then basted together. I like to use Sullivan’s basting spray for this. It keeps the foundation together nicely, doesn’t gunk up my needle and there are no pins to move as I sew. 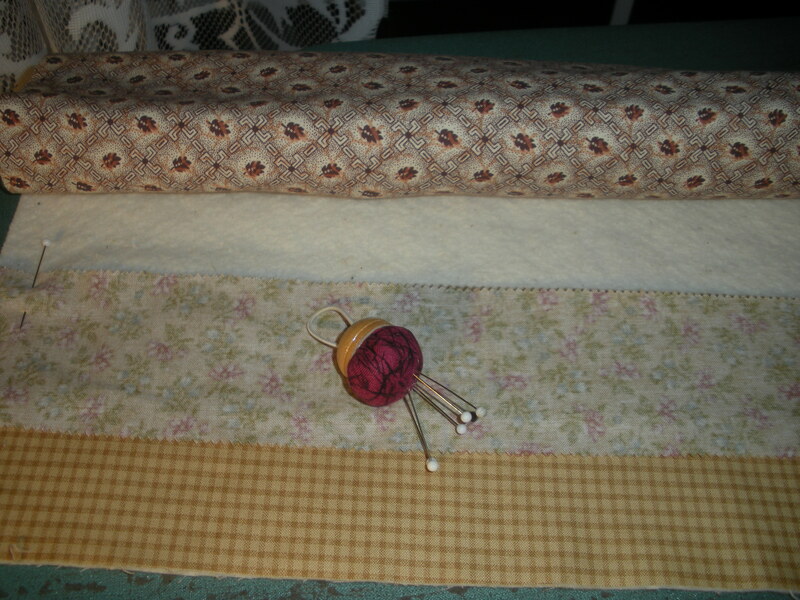 Below is a small-scale of what the “foundation” looks like basted and ready to start sewing. The only batting I use and recommend for these quilts is Warm & Natural. 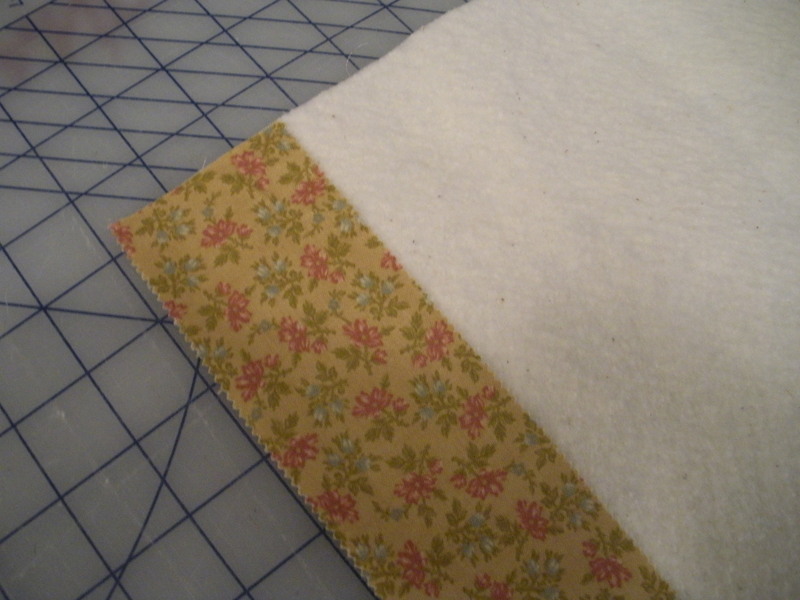 It has its own “velcro” type properties that eliminates all slipping while I sew these quilts together. The second strip is lined up on top of it, right sides together. 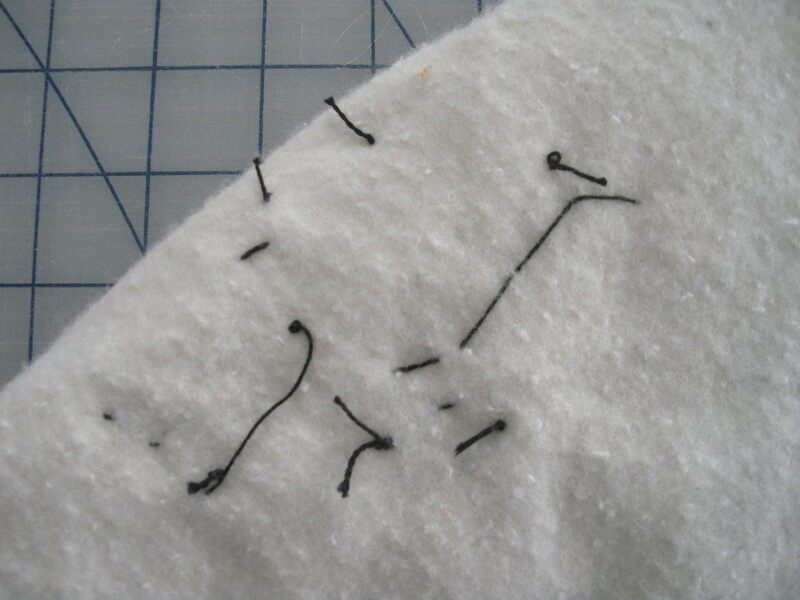 Two important things to remember while stitching, 1) use a walking foot and 2) use a long stitch length. 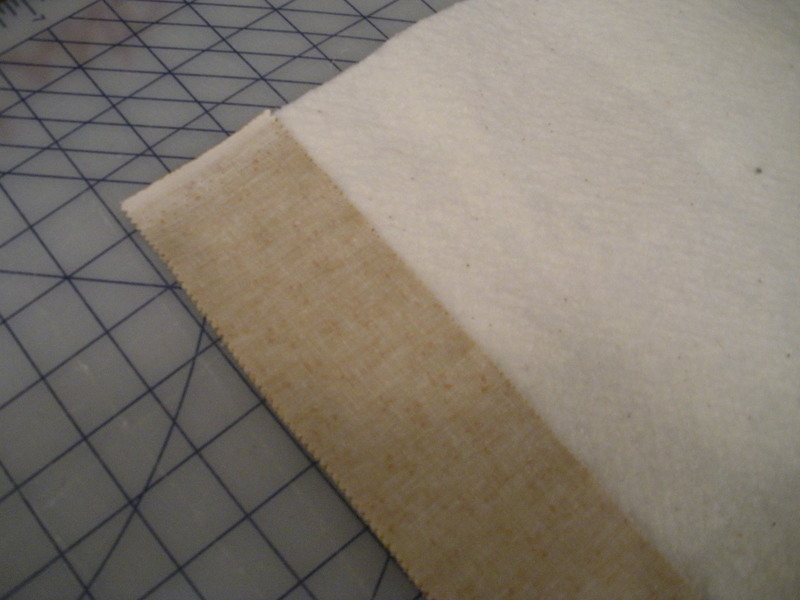 I set my machine to the longest stitch setting (8 stitches per inch). 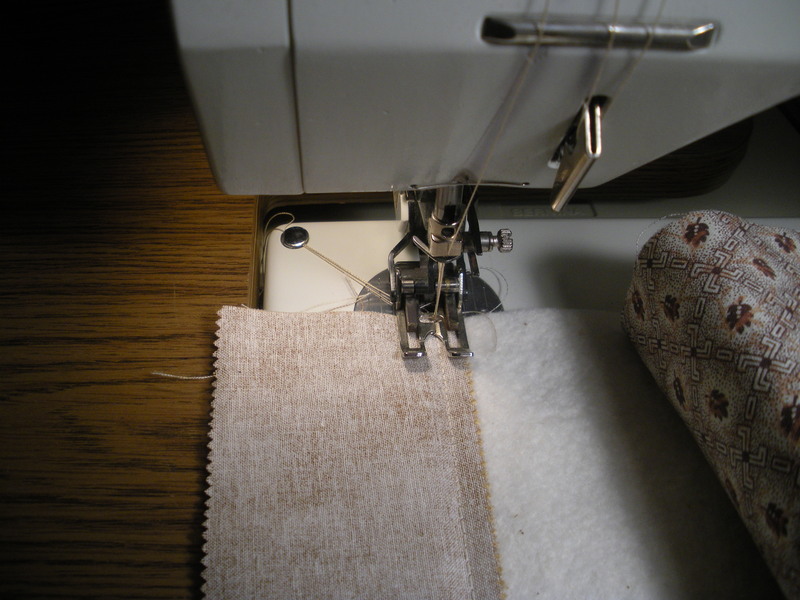 You’re quilting, not just sewing a seam. Next comes the pressing. 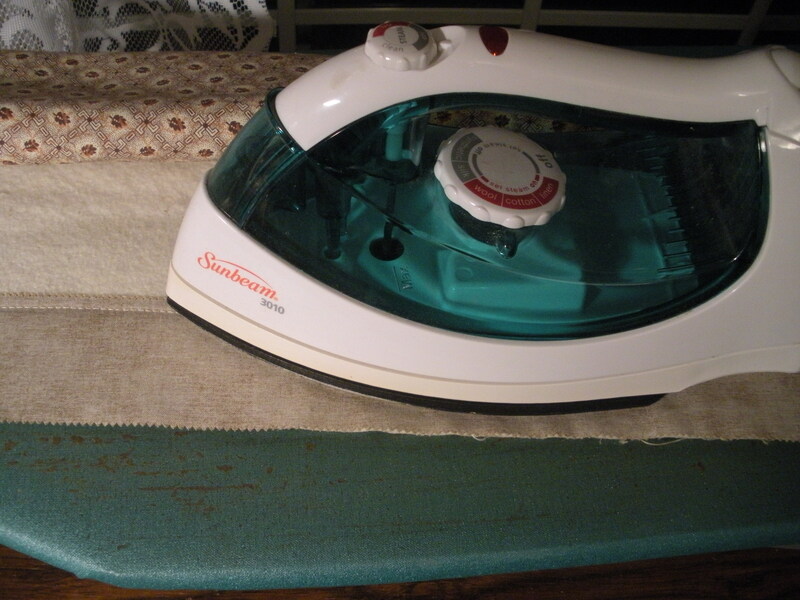 With the strips still flat as sewn, press, picking up the iron as you work down the strip not sliding it. 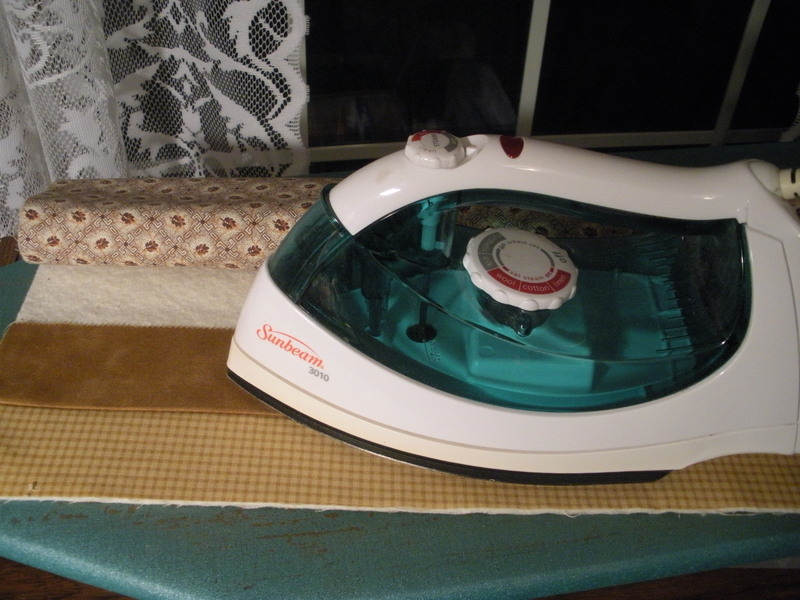 I also do not use any steam, notice empty iron! Open the top strip out, then press again. Be sure to not slide the iron, pick it up instead. Continue sewing strips on in this manner.Once all of the strips are sewn onto the foundation your quilting is done. Add the binding and the quilt is finished. One last favorite thing I’d like to note is a finger pin cushion. 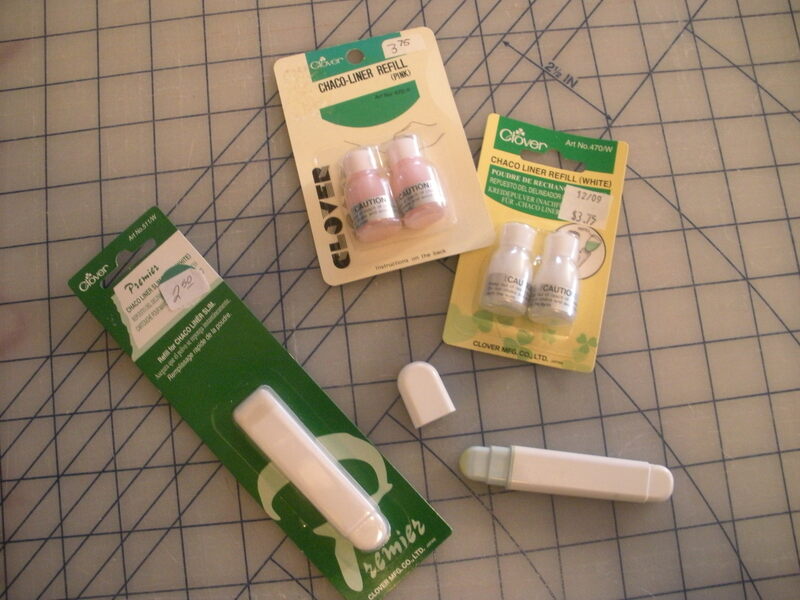 This keeps my pins with me at my sewing machine, at the iron, and at my pinning table. This is a big time saver for these projects. 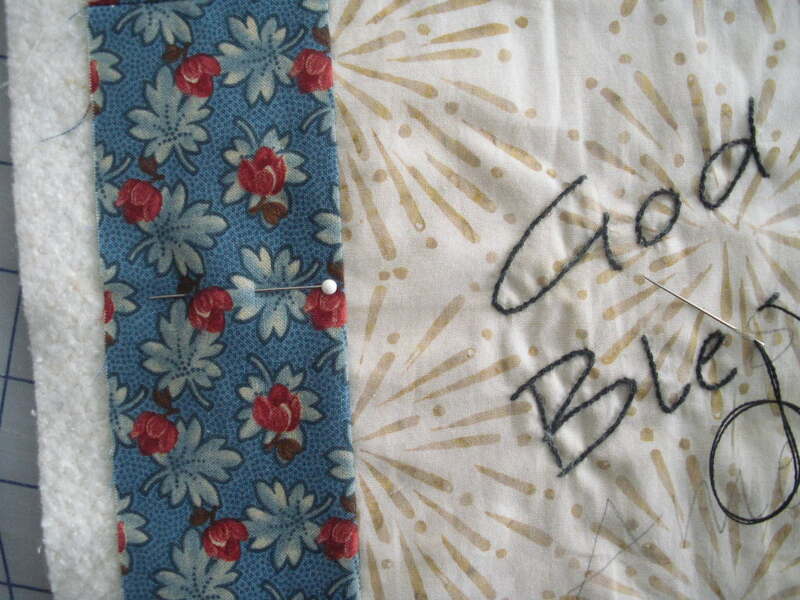 Some of the quilts have fusible applique and therefore require a bit of stitching to add before the binding. This stitching acts as more quilting. 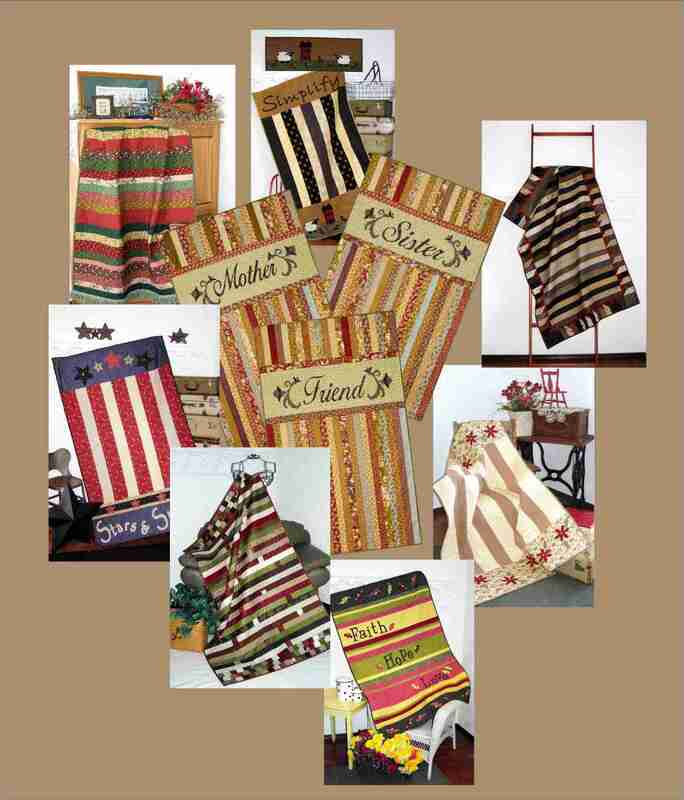 These quilts truly can be made in one day, 6-10 hours depending on which pattern you choose. 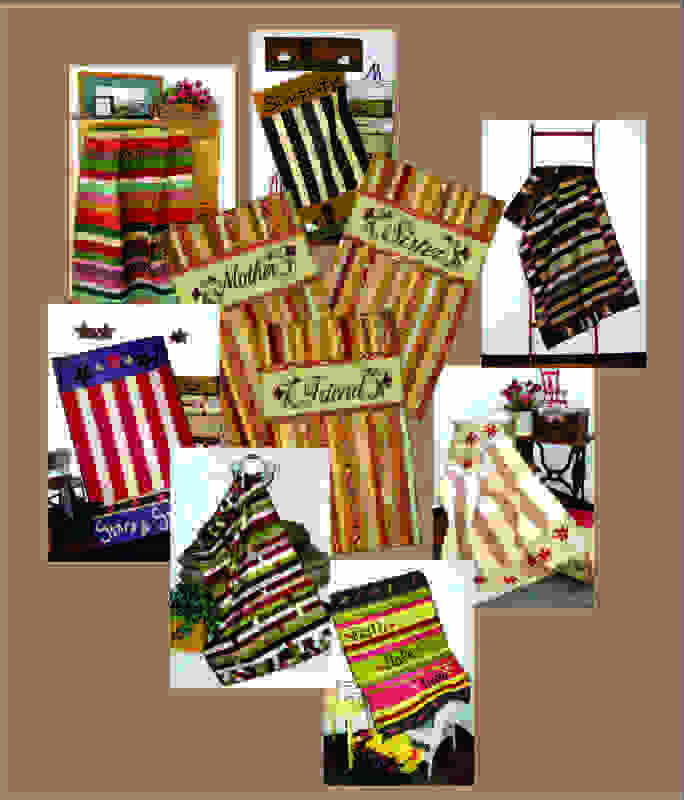 Several of the patterns are designed for jelly rolls and charm squares which really minimizes your cutting time. They make great gifts because they’re not a huge time or money commitment. If you don’t already use my favorite things, go to your local quilt shop and ask for them. Perhaps my favorites will become your favorites.